As I was trolling recipes on the internet this week, after a trip to the Farmer's Market and my purchase of a pound of fresh cut okra pods, I started thinking about ethnicity, heritage and okra. 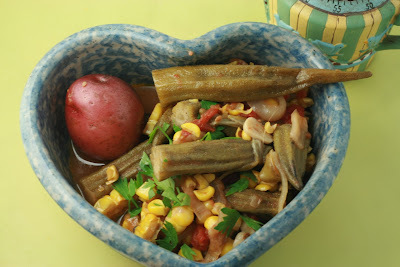 I love okra just about any way you can prepare it. Being raised in the South, we added it to soup and gumbo, and of course cut into discs and then deep- fried (the only way I could interest my girls in okra, when they were young-- and that was only after telling them it was like eating popped corn!). Okra is known by many other names in many other cultures. I know of at least two: bammies and lady fingers. 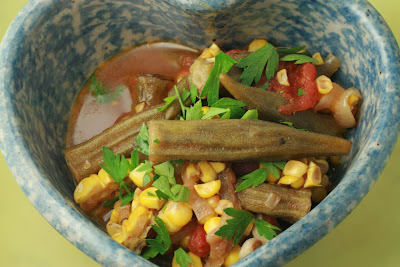 One of my very favorite ways of eating okra is a stew of okra, corn, and tomatoes. One always knew, when that combination started showing up on the dinner table, or on the menu of a home-cooking restaurant, that those three crops were in from the fields. I digressed and got carried away. Thanks readers, for the indulgence. Back to this week, when I was looking at a Greek Food Blog this week, there it was, a very similar dish. I am not Greek, but really guys, I was amazed at just how similar the recipe was. The only difference: in the Greek dish, potatoes were added, where we always used corn. 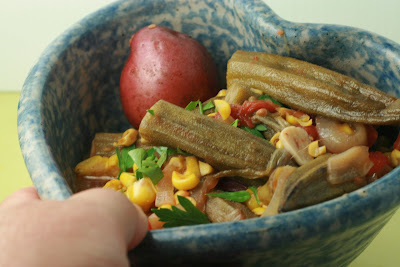 So, there was an ah ha moment and the small red skinned potatoes were added with the corn and we loved it. We're not all that different after all, are we? Good food always finds itself onto the table, no matter who you are, where you are or where you came from. reduce the heat to medium and and simmer for approximately 10 minutes. 2. Add okra, corn, crushed tomatoes, parsley, garlic, allspice and vegetable stock and bring to a boil. Adjust seasoning with salt and pepper, if needed. 3. Cover, reduce to a simmer and cook for about twenty minutes.